The indian Patent Office’s rejection of one of Gilead Sciences’ patents on sofosbuvir, which is used to treat the killer hepatitis C (hep C) infection, has put the spotlight back on the whopping cost of this drug. 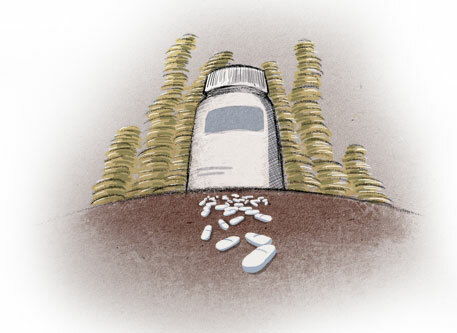 Treatment over a 12-week period costs $84,000, or an eye-popping $1,000 per pill per day, a price that not many even in the prosperous parts of the world can afford. Sofosbuvir, sold under the brand name Sovaldi, is a blockbuster drug that has revolutionised the treatment of hep C since it was approved in 2013. The new therapy is vastly more effective than the earlier weekly injection regimen spread over a year. Besides, unlike the earlier drugs, sofosbuvir is said to have less side effects. But this good news is offset by the prohibitive price of the drug, which is making even the UK’s National Health Service baulk at prescribing it. One estimate puts the tab at £1billon ($1.5 billion) for every 20,000 people treated. Gilead’s “price gouging”, as some health activists have termed it, revives the debate on how much it costs to bring a drug to the market and what pharma companies are justified in charging to recover their investment in research and development. For long, drug companies have claimed that it costs at least $1 billion to launch a successful drug but these claims have been exposed by many industry analysts. The most famous expose was by Marcia Angell whose 2004 book, The Truth About the Drug Companies: How They Deceive Us and What to Do About It, showed that investment on R&D was less than half of the amount spent on sales, marketing and lobbying. While pharma companies may swear that their primary motivation is drug discovery and people’s health, they would find it impossible to deny they are profit-driven entities driven by the market. In 2011, Gilead bought Pharmasset, a Princeton-based pharma company engaged in the development of oral therapies for treating hep C infection. It paid an astronomical $11 billion for a company which was valued at just $5 billion. Yet, Gilead made a strategic acquisition, borrowing money for an all cash deal. One market analyst pointed out acidly at the time that a company “can do a lot of research for $11 billion”—if it wanted to do so, that is. Industry insiders agree. Jeff Williams, who heads Clinipace, a contract-research organisation, was quoted in a recent article in The Economist as saying that the small-to-medium companies that his firm works for manage to develop their drugs for less than $500 million. But Gilead was clear it wanted to straddle the expanding anti-viral space, and buying Pharmasset is a gamble that has paid off handsomely. Sofosbuvir is a blockbuster that has sent its revenues and profits skyrocketing. In 2014, revenues more than doubled to $24.2 billion, and, according to analysts’ estimates quoted by Bloomberg, earnings are projected to touch $12.8 billion. This is four times the 2013 figure. Now comes a most interesting report from Liverpool University, UK. A research project led by Andrew Hill of the university’s Department of Pharmacology and Therapeutics, says that affordable generic versions of sofosbuvir can be produced at less than a tenth of the current price charged by Gilead if there are “no patent restrictions on production and procurement of large orders for drug manufacture by generic companies”. Their projection: $68-136 to make sofosbuvir in about 15 years. Gilead, meanwhile, is appealing India’s rejection of the patent on its base compound on the ground that it lacked novelty. There are other uncertainties because more claims on Sofosbuvir are pending. For India’s 18 million hep C patients it’s going to be a long wait. This is a classic example of safeguarding the interests of foreign companies. There is wealth of knowledge in traditional herbal medicines. much of it has gone to other countries and they synthesise some of them and sell the technology to developing countries. Example:Serpasil - antihypertensive consisting of an alkaloid extracted from the plant Rauwolfia serpentina. Since ages plant Rauwolfia serpentine used in traditional medicine. In our rural areas in the past tribal people use to give KUNDA KASHAYAM(Boiled Juice from tree bark) for delivered women. They become normal within 10 days. So much strength comes from this. I collected the samples(nothing but neem,pongamia,Coconut etc.) and send them in 1970s to the then Director General of CSIR(Prof.Y.Nayudamma) and he in turn forwarded to the Director (Dr.Nityanand) of Central Drug Research Institute,Lucknow. The CDRI Director wrote to me informing that they have to conduct number of screening tests and if some body is going to finance it, they will undertake. I was not surpised by the reply: Standard Government Atttude ! Common sense tells that these tree bark is bitter and may act as Antibiotic ! Also rural people put the seed paste of Strichnos Potatorum(Chilla Ginja in Telugu)in Turbid water and the turbidity settles down. They take out the clear water. The same seed is put at the place where the scorpion bite is there and the seed sticks at the spot and after sometime falls down relieving the pain. I myself experienced it. In fact I used to keep some seeds at home. Why not Laboratories under CSIR,ICAR,ICMR take up such projects> After all they can take patents. Alternatively Private Laboratories can go in for synthesizing some of these traditional practices. Our Motto should be MODERNISE THE TRADITIONAL - TRADITIONALISE THE MODERN. Since Our Prime Minister emphasizes MAKE INDIA why not include traditional medicine modernization as MEDICINE INDIA. MI - Make India: To make Ã”Ã‡Ã¿Make IndiaÃ”Ã‡Ã– at par with other countries such as China, Indonesia, Brazil etc, leaves significant headroom for rapid migration in future. India has to create manufacturing hubs under this vision to generate jobs. This will help in pushing the job profiles in urban hubs from the current focus on knowledge workers alone, further creating jobs for everyone. This will link to providing houses for all categories of citizens including those who come to the cities to earn and require different formats of houses at different price points and in locations close to their workplaces. SI Ã”Ã‡Ã´ Skill India: Skills and knowledge are the driving forces of economic growth and social development for any country. It has been observed that countries with higher and better levels of skills adjust more effectively to the challenges and opportunities. It is also important for skilled labour to take up jobs that the urban sector throws up. Naidu said, Ã”Ã‡Â£The government understands that the process of development and reduction of unemployment can be expedited only through skill development.Ã”Ã‡Ã˜ Under the Deendayal Antodaya Yojna (DAY), the government will focus on skills up-gradation and training activities. Apart from this, the government has also created a new ministry of Skill Development. Training and parting knowledge to those looking for job in the construction sector such as construction workers, architects and artisans would also figure in this initiative. DI Ã”Ã‡Ã´ Digital India: Naidu said that to be at par with the world, it is important to go online. Ã”Ã‡Â£We are rushing towards urbanisation, talking about smart cities but without digitalisation the goal cannot be achieved,Ã”Ã‡Ã˜ he said. The digitalisation of land records, property application and property details of the cities is significant. This will also help in increasing transparency, the key for the growth of the housing sector. Recently, Hyderabad showed the way, due to digitalisation of records, the revenue of Hyderabad increased manifold. CI Ã”Ã‡Ã´ Clean India: For a country to grow economically, cleanliness, proper sanitation and hygiene are important. Ã”Ã‡Â£Currently, majority of the population has no access to toilets and the cities and villages do not have property solid waste management. To make Ã”Ã‡Ã¿Clean IndiaÃ”Ã‡Ã– a reality, a significant behavioral change is required across the cities and villages of the country,Ã”Ã‡Ã˜ says Naidu. Under this mission, the cities are required to be converted into liveable cities, that will attract more habitation and ensure healthy and green environment for citizens. The Swachh Bharat Abhiyan (Clean India Campaign) by the government is the first and progressive step towards liveable, healthy, planned and effectively governed cities(Venkaiah Naidu announces MISIDICI vision for urban cities, November 21, 2014,magicbricks.com). P. niruri is an important plant of Indian Ayurvedic system of medicine which is used for problems of the stomach, genitourinary system, liver, kidney and spleen. The plant has also been used in Brazil and Peru as an herbal remedy for kidney stones. Common names for Phyllanthus niruri include Chanca Piedra in Spanish,Bhumyamalaki in Ayurveda, and Quebra-Pedra in Portuguese. The herb is known as Keezha. Nelli meaning 'berry under') in Tamil, Nela Nelli in Kannada,Keezhar Nelli in Malayalam and Nela Usiri in Telugu. It has many other common names in assorted languages, includingdukong anak, dukong-dukong anak, amin buah, rami buah, turi hutan, bhuiaonla, and Meniran. One Homeopathy Doctor cured the white spot on the forehead for a women(because of putting cheap Kumkum) successfully with the juice applied on this spot from P. niruri . Like this he cured many cases. It is for the modern medicine to identify such practices to synthesize them. Rich knowledge exists in Folk medicines in practice in Africa, Latin America,Asia. One should not ignore the fact that not all rural people go for Allopathy(for that matter even some urban people in India as well as in developing countries). They have faith in local remedies. It is Science to help to modernize them and supply at affordable cost. When Homeopathy is popular in Germany why it is not so in Urban India?